When first introduced for the 2009 model year, the CC was breathlessly billed by Volkswagen as a "new offering designed and engineered to blend sports car dynamics and dimensions with sedan comfort in a sophisticated package." The company's first four-door coupe arrived with a dramatically swept roofline, frameless doors, a four-passenger cabin and very distinctive looks. It was arguably the most stylish model in the company's entire lineup. But things have changed for 2013. The automaker has treated itsCC to a mid-cycle update that includes a substantial facelift, equipment changes and a new five-passenger cabin for our domestic market. 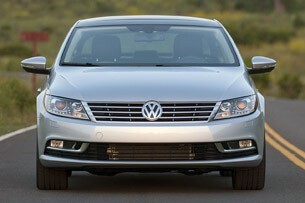 We recently spent a week with the refreshed Volkswagen CC in the Los Angeles basin. Our primary objective was to see how well the midsize four-door would integrate with family duty. We were also intrigued by its "sports car" claims, as its pricing ambitiously aligns it with some seriously talented competition. Lastly, as some are questioning its validity in the lineup compared to the larger all-new Passat, we wanted to understand its value. How well does the refreshed CC fare? Continue reading to find out. 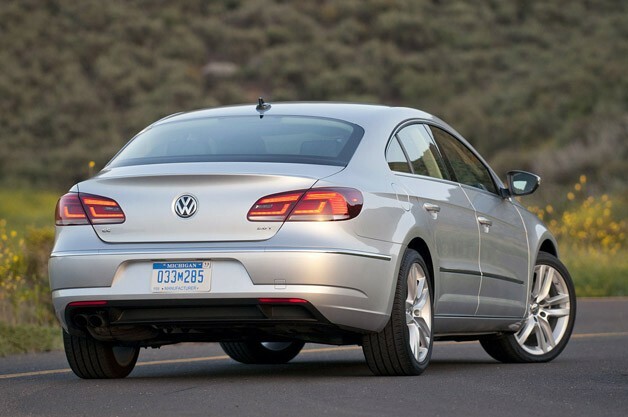 As it has been since launch, the 2013 Volkswagen CC is again offered with two engine choices. The smaller of the two is a turbocharged 2.0-liter four-cylinder rated at 200 horsepower and 207 pound-feet of torque. It arrives with a traditional six-speed manual gearbox as standard equipment or with a six-speed dual-clutch gearbox (Volkswagen's "DSG") as an option. All four-cylinder models are front-wheel drive. The turbocharged 2.0L four-cylinder is rated at 200 horsepower and 207 pound-feet of torque. The larger engine is a naturally aspirated narrow-angle 3.6-liter six-cylinder rated at 280 horsepower and 265 pound-feet of torque. A traditional six-speed Tiptronic automatic is standard, and consumers are offered the choice between front- or the automaker's 4Motion all-wheel drive. All models share a strut-type sport-tuned suspension, with coil springs and telescopic dampers up front and a compact multilink coil-spring design in the rear – both damping and ride height is fixed. The steering rack is electro-mechanical with variable assistance based on vehicle speed, and there are disc brakes at all four corners (with slightly larger rotors on the six-cylinder model). Base models arrive wearing 17-inch wheels, and premium models are fitted with larger 18-inch alloys (wearing 235/40R18 tires) in various designs. The exterior has lost some of its swoopy distinctiveness, but is still unmistakably a VW. As mentioned, the 2013 model is at the receiving end of a mid-cycle update. Most obvious is the model's new front and rear styling. In the nose, bi-xenon projector beams with LED daytime running lamps (on all but the base model) align the CC with the rest of its siblings – and nearly everyone else as the industry jumps on the trend. 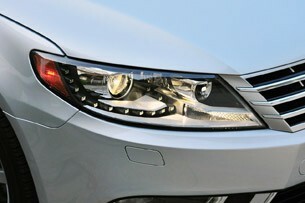 Complementing the headlights is a new grille and reshaped bumper. The side sills have been slightly resculpted to be more prominent and the rear bumper has been given a bit more volume and fitted with LED taillights (the license plate is now also illuminated with LEDs). While handsome, the exterior has lost some of its swoopy distinctiveness in the alignment, but is still unmistakably a Volkswagen. All previous CC models were configured with a four-passenger cabin, a deal breaker for many (including your author) shopping in this segment. Volkswagen has addressed the issue for us in the States by removing the rear seat center storage console and converting the area into a seat with obligatory three-point belt. The new setup might not be quite as luxurious for two rear-seat passengers, but you'll probably want to run outside and listen for the collective "thank you" cheer from Volkswagen salesmen around the country nevertheless. 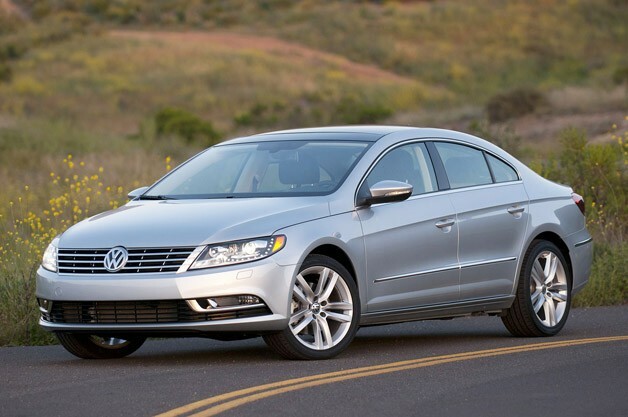 Our test vehicle was a 2013 Volkswagen CC 2.0T in Lux trim, configured with the automaker's familar 2.0-liter turbocharged four mated to the six-speed dual-clutch automatic - a manual transmission is not available in the Lux. Adding to the standard features on the Sport Plus model, the Lux arrives with 18-inch St Louis-pattern five-spoke alloy wheels, dark brushed-aluminum interior trim, ambient cabin lighting and an expansive power-operated glass sunroof. The base price of $35,355 included our car's Candy White exterior paint over Desert Beige/Black Leatherette interior, but the optional carpeted mat kit added $235 to our price. Add it up, throw in the mandatory $820 destination fee, and the grand total out-the-door price of our four-door coupe was $36,410. The grand total out-the-door price of our four-door coupe was $36,410. Hold that thought, as we will come back to pricing shortly. Like all high-end vehicles with frameless windows, the door glass drops a fraction of an inch when the handle is pulled only to retract into its seal when the door is shut again. For some reason, we kept finding ourselves winning the race on our test car, and the doors would hang slightly on the seal when quickly opened (maybe the delay to open is longer than on most?). That minor annoyance, and a need to watch one's head when dropping into the rear seats, were the only apparent physical drawbacks to the CC's styling. From the driver's seat, there is plenty of room, even for your author's six-foot, two-inch frame, and outward visibility is strong. Once you're back there, the rear seats aren't as cramped as the roofline would suggest. The CC Lux doesn't come with steering wheel-mounted paddles, and they were sorely missed. 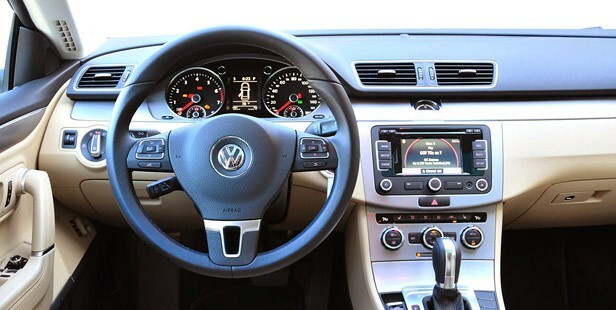 The rest of the cabin is typical Volkswagen, from the primary instrument cluster (with a monochromatic multi-function display) right down to the window switches. As expected from a VW Group product (a few newer miscues aside), everything feels high quality and most primary controls are intuitive. Despite its appearance, the seat upholstery is not leather. The vinyl is perforated to prevent heat buildup, but it feels hard and synthetic without fooling anyone. We would have preferred high-grade cloth or the available genuine cowhide. 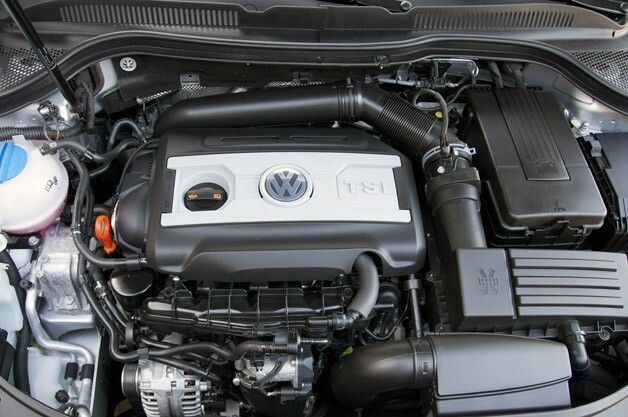 Volkswagen's turbocharged 2.0-liter is hard to fault, and it's a good fit for the CC. Acceleration is quick off the line, strong around town, and the DSG does a nice job automatically rowing through the gears all by itself. Manual control is offered on the shifter (press forward to upshift and pull back to downshift), a control arrangement that we have always found cumbersome. For some unknown reason, the CC Lux doesn't come with steering wheel-mounted paddles, and they were sorely missed with this slick gearbox. 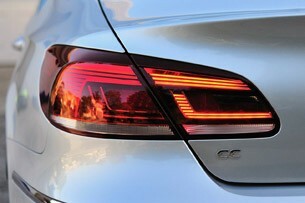 Out on the roads in and around LA, we also missed the "sports car dynamics" that VW promised with the CC. Without question, it handles well, but no better than a standard Audi A4, as far as that is concerned. Understeer is the rule when cornering hard (much of the blame is to be directed at the all-season Continental ContiProContact rubber), and the steering tends to veer towards the numb side of things. It's a very competent front-wheel-drive sedan with sporty pretenses and very enjoyable to drive in its own way, but calling the CC a sport sedan is completely misleading. Put it this way: We were never compelled to wring it out on Mulholland Highway. The CC feels tighter and more compact from within the cabin, largely thanks to its sloping roof. But on the highway, the CC demonstrated excellent manners. Its firm European suspension tuning allowed us to comfortably dart around traffic and exit freeway ramps at greater than the posted speed, but it was always compliant enough to absorb all but the largest craters in the asphalt. We racked up many very comfortable miles in this Volkswagen. The CC is slightly shorter in length when compared to the Passat(188.9 inches as opposed to 191.6 inches) and it has about 10-percent less passenger volume (93.6 cubic feet as opposed to 102.0 cubic feet). While the dimensions aren't that far off, in practice the CC feels tighter and more compact from within the cabin, largely thanks to its sloping roof. The new fifth passenger seating position is good in a pinch, but adults (and kids, quite frankly) won't want to occupy it for a roadtrip. Don't buy a CC for its interior room. In terms of gripes, we didn't like the retractable fabric shade over the moonroof. It is designed to block the sun from our scalps, yet it still lets too much light and heat into the cabin. The navigation system feels cheap and outdated even when compared to today's handheld units, and it doesn't allow the user to see "the big picture" (it cannot be zoomed all the way out). Lastly, we found some visual distortion in the nearly horizontal rear glass window. 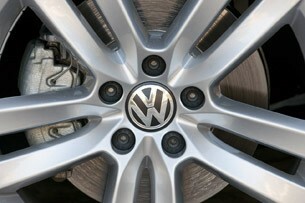 Volkswagen's facelift and update appears to us as a bit of a softening... a move towards mainstream. But then there is the question of cost. As a reminder, the out-the-door price of our CC was $36,410. At that sum, one is bumping into a number of premium-badged offerings, including the very competent BMW 3 Series at $35,795. What's even more concerning is that the same money will also get a very nice Audi A4 Premium Plus, more powerful and configured with leather (but lacking navigation), at $37,675. Don't forget the Infiniti G37, at $34,895, either. For an import shopper, this price point is rich in very good choices. The CC's styling has always differentiated it from the competition (it remains the only four-door coupe in the segment). 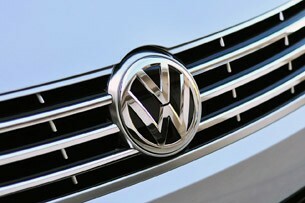 However, Volkswagen's facelift and update appears to us as a bit of a softening... a move towards mainstream. When the five-passenger cabin is factored in, regardless of how welcome it is, the CC's uniqueness in this crowd is even less so. Five years ago, the CC was a breath of fresh styling over a very good midsize sedan. Today, little more than its roofline sets it apart.